LSP Heavy Duty Suspension Insulators are used for applications in which large mechanical loads are encountered on high voltage antenna assemblies. They provide a long insulating path between the metal fittings to protect against electrical leakage and flashover. A wide range of sizes and strengths are available in this type of insulator with greater strengths and leakage lengths attainable by combining insulators into assemblies. The ceramic is available in white or brown glaze. 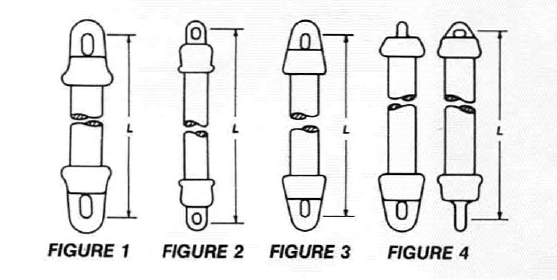 Metal end caps can be supplied as either single or double loop in manganese, silicon, aluminum bronze, anodized aluminum, or galvanized malleable iron.